Google I/O is but months away, so it's right about time to start organizing the trip. There's one problem: tickets. As with previous years, getting tickets is a random affair, with Google making no preference about who attends, developer or not. As such, the application period entry is from February 22 10AM PST until February 27 at 5PM PST. 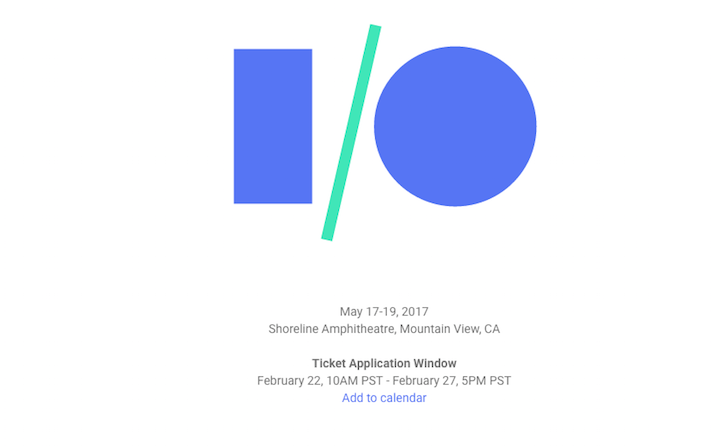 I/O this year is at the Shoreline Amphitheater - the same venue as last year - in Mountain View, on May 17-19. In 2016, Google gave out sunscreen and sunblock to attendees, although I've heard numerous people grumble about it being too hot, too sunny, and not enough water supplied. With that said, when Google announced the 2017 venue as Shoreline Amphitheater a few months ago, I was surprised. Nevertheless, I'm sure I/O 2017 will see as many, if not more, attendees than 2016. There's an 'add to calendar' function for the registration period so you don't forget, and as ever, we'll keep you updated.